Brittany (Brittany Property Guide), that very special region that is found in the north-western corner of France, needs little or no introduction. Surrounded on three sides by the sea, Brittany is a land of picturesque fishing villages, glorious beaches and attractive seaside resorts, a unique architecture and culture and a green, wooded countryside. Its location also endears it to British property seekers and holidaymakers as it is easy to reach from the UK, with the ferry ports of St Malo (St-Malo Property Guide) and Roscoff (Roscoff Property Guide) offering ease of access by sea, and the airports of Dinard (Dinard Property Guide) and Rennes (Rennes Property Guide) offering access by air. Part of Brittany's appeal lies in the charm of its old villages, where the Breton architecture and character create a very special atmosphere. The following is a guide to six of these villages (in no particular order), some listed officially as Brittany's finest, others less well known but equally as rewarding to see. Moncontour simply oozes character and charm, and this is evident the moment you arrive in this gorgeous mediaeval village. Even the approach to the village is special, with beautiful green countryside composed of rivers, forests and lakes surrounding it. Once inside the village, the little streets are lined with many authentic colombage (half-timbered) houses, creating a scene straight from the Middle Ages. Steep steps take you to the higher reaches of the village, from where you can enjoy panoramic views, and take in too the lovely leisure lake that lies on the edge of the village and which provides the perfect place to cool off and get a little healthy exercise and fun on warm, summer days. The village is best known for its mediaeval charm, but it is also well equipped to cope with the needs of modern day residents and visitors. All the requisite small shops are at your service here, including the essential boulangerie, boucherie, a post office, a bank, a pharmacy and several more. Even better, for fans of French gastronomy, the village has a choice of very good cafés and restaurants. Being listed as a "beautiful village of France" does mean that it can become rather busy in the peak holiday season, as visitors spot the name in their guide books and hasten to discover it for themselves. 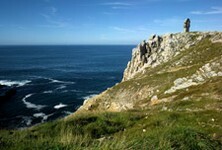 If your idea of a perfect Breton destination is an old fishing village, complete with superb seafood restaurants and close to all the attractions of the region yet remaining calm and authentic in itself, then Saint Briac sur Mer, in the Ille et Vilaine department (Ille-et-Vilaine Property Guide), is your destination. What makes Saint Briac sur Mer special? The village is a classic Breton fishing village, sporting all the colours and typical features that make Brittany one of France's best loved regions. The harbour is full of bright little boats, some fishing vessels, others sports and pleasure craft, and their constant comings and goings will keep you entertained for hours. The seafront is lined with inviting restaurants, where the best of fresh seafood is always on the menu. Saint Briac is perfect for family holidays too, as in addition to its original character and charm, it has several clean, sandy beaches and safe bathing for children. The village is pretty enough to have served as inspiration for artists of the calibre of Renoir and Rivière, so if you feel a sense of déjà vu when you wander the tiny old streets, don't panic, you have probably seen Saint Briac in a painting! The location of the village is perfect as a base to visit Brittany's main attractions such as the mediaeval town of Dinan (Dinan Property Guide), just six kilometres distant, and also just slightly further from St Malo. There are also plenty of activities near at hand for sporty types, including golf courses. As with any popular coastal town, tourism can make things a little hectic in July and August, and car parking can be a little tougher than usual at these times. However, the village is so lovely that you don't hear too many complaints. Bécherel, in the Ille et Vilaine department, is not perhaps the first place you would think of for a holiday in Brittany, but once discovered it quickly becomes a firm favourite. It lies well inland, which tends to allow it to keep its charms hidden from mass tourism, but its listing as a "little City of Character" draws the more discerning to seek it out. Bécherel is undoubtedly very attractive, with old winding streets, original houses and an air of being loved and cared for by its residents. It has a rich history and heritage, so fans of built heritage can enjoy taking in the old buildings and squares, and delving into its past life as a military stronghold. However, what marks Bécherel out as really special is its status as a "Book Town". Since 1989, Bécherel has been an official "Ville des Livres", a place where book sellers and collectors of rare books gather and display their wares. Browsing the dusty old tomes is fascinating, but even if you are not a student of historic French literature, there is plenty to enjoy as new and second hand modern books, many even in English, are also offered for sale. Some of the book shops add to their appeal by also offering café services, so you can take refreshment during a break from book browsing. It is also worth noting that the village hosts cultural (usually book related) events throughout the year, with a book market held every first Sunday of each month. It is a pretty calm little place, at least when the tourists vacate it in winter and no event is taking place, so perhaps if you are looking for a base for lively teenagers or are hoping to hit the highspots of a lively town in the evenings it may not be ideal. There are crèperies and a few cafés, but definitely no nightclubs! Take your camera or your paints and easel, as you will surely want to capture the beauty of La Gacilly if you have any sort of artistic talent. Quite simply, La Gacilly is a dream village. It is set on the River Aff in the Morbihan department (Morbihan Property Guide), and is possessed of the kind of picturesque qualities that usually only exist on chocolate box lids. What makes La Gacilly special? La Gacilly is exquisitely pretty, with its traditional stone cottages bedecked with flowers (it is a listed "Ville Fleurie"), its river, and its heritage features such as old bread ovens, fountains and even menhirs, but its particular speciality is that it is a town of arts and crafts. Potters, painters, metal workers, glass blowers, leather craftsmen, book binders... all manner of crafts are represented here with ateliers (workshops) to visit and goods offered for sale. It is also the home of the Yves Rocher beauty empire, and the luxury spa hotel he had built there to showcase his products has a fabulous restaurant, if you feel like a real treat! Should you tire of visiting the workshops and gazing at the old streets and houses, it is possible to take boat trips along the river from the village. The village is only small, and once the initial charm and interest of the artisanal workshops has worn off, there isn't really much to do. That said, a short drive in any direction will allow you access to plenty of larger towns where you can enjoy markets, museums, or simply head for the lovely beaches and lively resort towns of the Breton coast. Meneham, in Finistère (Finistère Property Guide), qualifies as a real hidden gem of Brittany, and despite a dedicated restoration programme which has seen the village restored to superb condition, it is little known to tourism. It really is a hamlet rather than a village, but well worth a look as it is truly amazing. One quick glance will tell you immediately what makes this village special. It is, quite simply, unique. A village of the rocks, this was once a fishing village where life was tough, but today, after its restoration, Meneham is idyllic and fascinating. Huge rocks dominate, with cottages of the same colour as the boulders nestling in between... quite an incredible sight. When the village was fully inhabited, the people made their living by fishing, beachcombing and harvesting seaweed in the traditional, time consuming way. It is possible to see this method demonstrated on the beach at Meneham today. Craft shops exist in the old houses in the centre of the village, and even the old inn has been resorted and is open for business to provide refreshment for visitors. Although the restoration work has recreated an important and beautiful little piece of Finistère's history, the village is no longer really... real. It is a showcase, a living memorial to the way of life that has passed, but still a remarkable place and more than worth a visit. The village of Léhon, in the Côtes-d'Armor department, is our last port of call on this tour of a selection of Brittany's finest villages. Close to the celebrated town of Dinan, with all its medieval splendour, Léhon offers its own charm and heritage. Léhon lies along the banks of the River Rance, giving it a picturesque setting and the benefit of lovely, tranquil riverside walks. The village grew up around its 9th century Benedictine abbey, and not only does this important monument still exist, but there is also a restored 12th century feudal castle. Besides these two wonderful buildings, Léhon includes in its heritage a mediaeval bridge and lovely original houses, many of which display carved lintels and moulded cornices and other interesting architectural features. For a little light relief, or for cooling off on summer days, there is a very good outdoor swimming pool. The village is pretty small so with only one boulangerie and one restaurant. 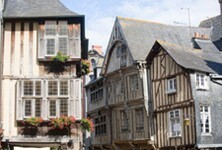 But it also offers very easy access to the town of Dinan with all its sights and facilities. It is, in short, a perfect village of character right on the edge of one of Brittany's favourite attractions. Like many of the little villages in Brittany it can be a little quiet if you're looking for thrills and excitement! There is, of course, much more of Brittany to explore once you have visited the villages listed above. Four further villages: La Faou, Locronan, Rochefort en Terre and Souliac (in addition to Moncontour, listed above), are designated as among the most beautiful in France, and are definitely also worth adding to the agenda. Malestroit, in Morbihan, is another of note and to this you might add... well, the choice is yours... they are all out there to discover.